A talon cusp, also known as an “eagle’s talon”, is an extra cusp on an anterior tooth. The term refers to the same condition as dens evaginatus, but the talon cusp is the manifestation of dens evaginatus on anterior teeth. The incidence has been found to range from less than 1% to 6% of the population. Of all cases, 55% occur on the permanent maxillary lateral incisor, and 33% occur on the permanent maxillary central incisor. 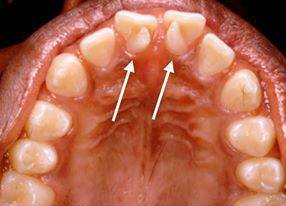 They are found rarely in primary teeth.